The bad news: it can’t always be sunny. But it’s a great excuse to pile on more, more, more. 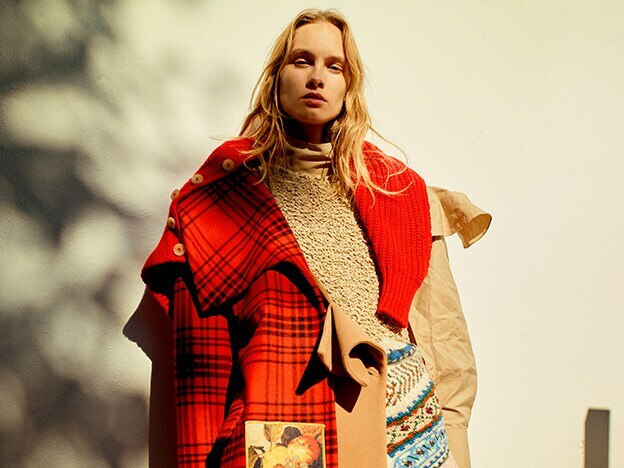 We’re talking knits, coats, jackets, tailoring and, of course, doubled-up accessories. Here’s how we’ll be doing it. PHOTOGRAPHY EDDIE WREY AT CLM. STYLING KATIE BURNETT AT FRANK REPS. MODEL KITTI AT WILHELMINA. HAIR MARK HAMPTON AT JULIAN WATSON AGENCY. MAKEUP ANNE SOPHIE COSTA AT D+V MANAGEMENT. 2018 tailoring comes with room to spare. Think of it this way, you’re free to eat pasta. Above: coat (coming soon) by Pringle of Scotland, blazer by Delada, skirt (worn over trousers) by A Peace Treaty, trousers by Y/Project from Spazio Pritelli, boots by Reike Nen from Browns, tweed bag by Miu Miu from Browns, sweater (worn around shoulders) by Prada from O’, and scarf by Missoni. This season is all about big-time accessories from the heavy hitters. 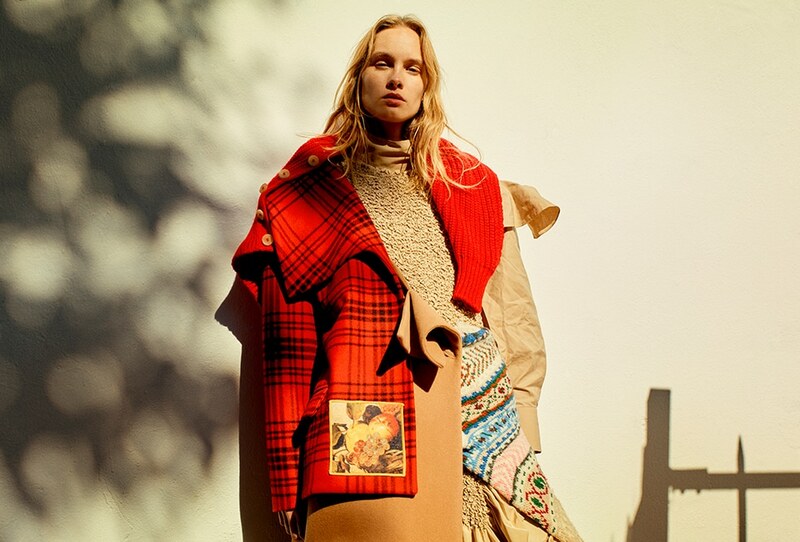 Fendi, Maison Margiela and Calvin Klein 205W39NYC deliver the real hot tickets this season. Above: denim jacket by Delada, hat by Fendi from Auzmendi, sweater (worn around shoulders) by Calvin Klein 205W39NYC from D’Aniello, scarf by Pringle of Scotland, and bag by Maison Margiela. Occasionally we advise restraint, but not this time… Embrace clashing colour: we’re partial to tomato red with hot pink. Above: gilet by Prada from D’Aniello, sweater by Calvin Klein 205W39NYC from Liska, skirt by Marni, boots by MM6 Maison Margiela from Sugar, hat (in right hand) by 1017 ALYX 9SM from Browns, and bag by JW Anderson from Browns. Layering shouldn’t feel bulky. Like so many things, it’s all about balance. Supersized knits with slim, neutral tailoring. It hits the sweet spot between relaxed and well thought out. Above: striped sweater from Base Blu, sneakers from Browns, and pink sweater (over right arm) from Tessabit, all by Calvin Klein 205W39NYC; skirt by A.W.A.K.E., hat, gloves, and orange scarf (over right arm), all by Raf Simons from Antonioli; and purple scarf (just seen, over right arm) by Missoni. Strokable, huggable, touchable fabrics are front and centre this season. Extra points for anything patterned. 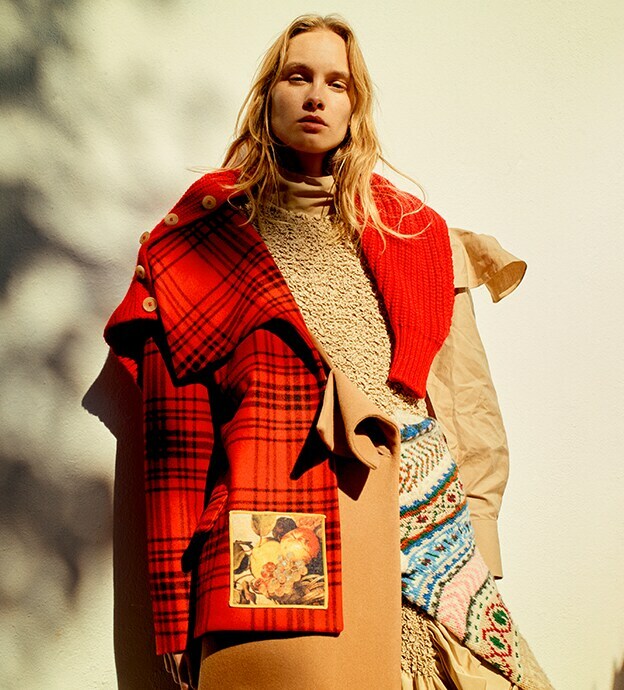 Above: coat by Au Jour Le Jour from Elite, dress by JW Anderson, shirt (just seen) and sweater (worn around shoulders), both by A.W.A.K.E., and sweater (worn around waist) by Preen by Thornton Bregazzi.